Another day when things didn't go to plan. You can maybe get an idea why I don't try to follow timetables and a curriculum, I would get utterly frustrated when life got in the way. As mentioned yesterday, today should have been a trip to the museum and visit to the home-ed group. Unfortunately I woke up with a terribly banging headache. I took painkillers and hoped it would ease, but really didn't think it was a good idea to drive in case it developed into a migraine (I've suffered with migraines since school). I was disappointed as I do enjoy our weekly trips to Exeter, and the kids were disappointed as they wanted to see their friends. They are very understanding though (they have to be with a mother like me!) and didn't complain. So we had an unexpected free day. What does a mother of 5, suffering with one of the worst headaches she has had for a while as it feels as though her head will literally explode, decide to do on such a day? The said mother decides to surprise her husband and make a start on painting the dining room - something which we have put off and put off for months and months and months. Do you ever get the feeling you wished you hadn't started? I got that urgh feeling almost as soon as my roller hit the ceiling! We have lived here in this house for 5 years. The walls of the dining room have got grubbier and grubbier, and it's gone past the stage of being able to wipe them clean. For the first 3 years of our time here, we were reluctant to decorate as the ceiling had a hole in it where the plaster had fallen down. We were waiting for the landlord (brother) to get it sorted. The plastering was finally done a while ago, but financially and health wise we have struggled to get it re-decorated. Feeling much brighter once the painkillers had kicked in, I set about getting out the paint supplies and seeing what we had. We have chosen to go for a boring Linen colour, with a burst of purple on the chimney section. My thinking was to go for bland and boring walls that can be brightened up with ultra jazzy and colourful handcrafted goodies. I have ideas for painted art, crocheted wallhangings, and needlefelted goodness. The seasons table will stay to add a bit of colour and interest. I am going to hang some voile fabric down from the top of this cove area to make it a little den-like for the children. I can see it becoming a favourite place to sit and read. 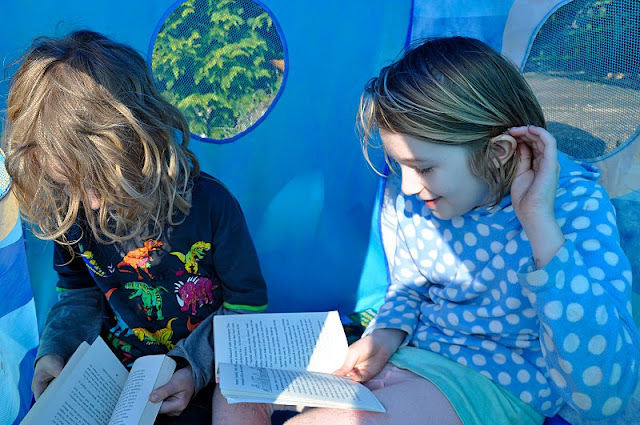 Both Tiegan and Callum were reading in our beach hut tent. 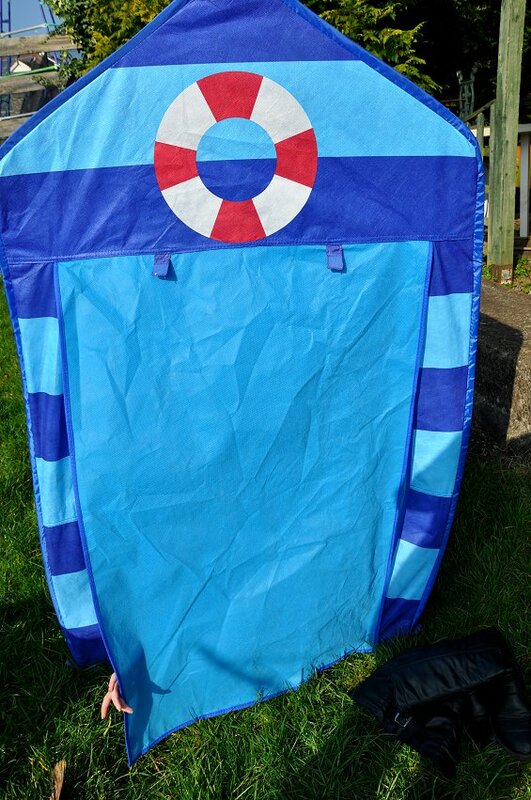 This really has been a great buy, the children love it, it's sturdy and easy to store. A short while later I saw them on the trampoline and playing with their scooters. They certainly made the most of a beautiful day. Apparently they were acting out "Skylanders" but with their own twist. They told me so when they came in to get bananas. In other news, I have signed up with Taisia to do a Music with Mummy course in Torquay, starting in April. I think she will really enjoy it. I've emailed the "teacher" and it sounds interesting, with no more than 10 children in a class. Tomorrow I'm hoping to finish the dining room so we can get that back to normality, and do a few crafty things with the kids, but we shall see what the day decides to have in store. 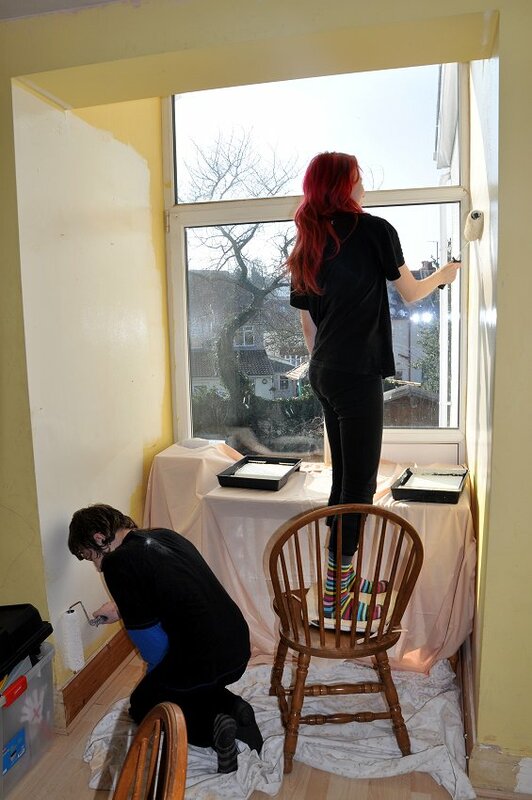 I bet its nice to have teenagers to help out with the decorating! Well done to Chelsea for getting into college. Its stories like these that I like to tell my MIL when she asks me for the millionth time "what about GCSEs?" 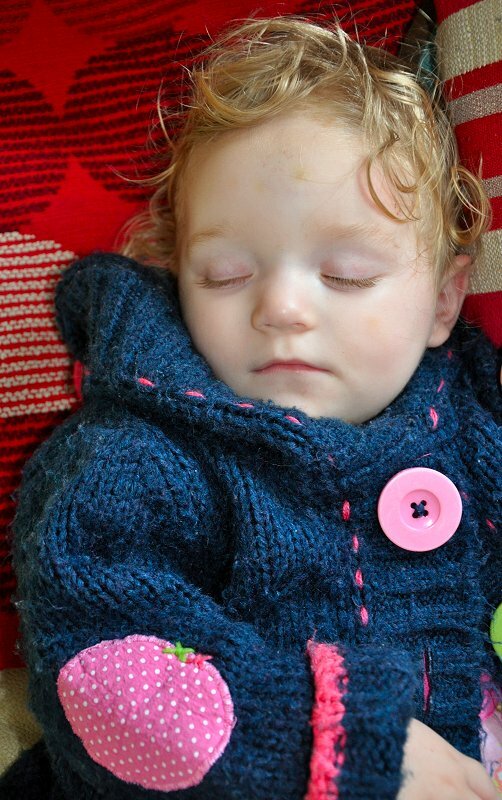 What a beautiful blog, found it after your introduced yourself on my 'introduction'! Your children look like they have such a wonderful relationship. 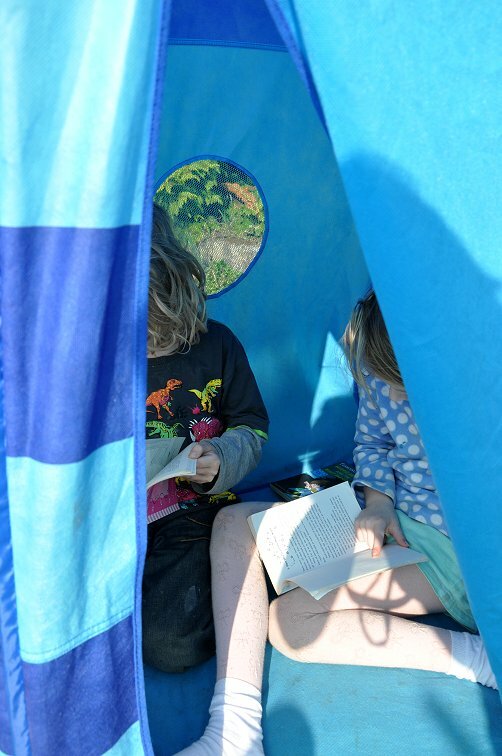 We have already decided we will be homeschooling our little one, and anyone else who comes along! How old is your youngest? And I thought I was crazy! Many moons ago Dave and I painted the lounge working throughout the night when Em and Kath were small... they'll be 26 years this July! Well done to Chelsea for gaining a place on the upgraded course.